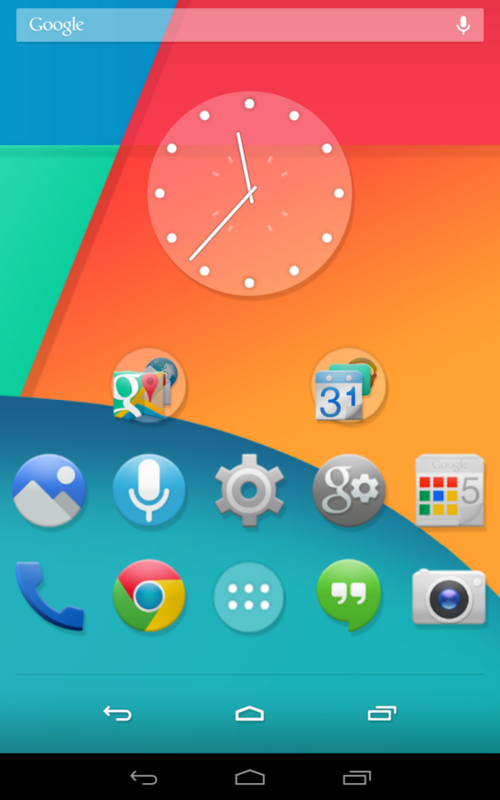 KitKat 4.4+ Experience Launcher Theme is a brand new ultimate multi-launcher theme designed for all Android launchers, inspired by the new Android 4.4+ OS and the latest Nexus 5 leaks! Get the latest Android KitKat OS look on your phone or tablet, featuring custom-designed icons, new wallpaper designs, multiple dock bars options, folder enhancements, launcher elements, and much more! Featuring FULL graphics support on Nova Launcher, Smart Launcher, Apex Launcher, TSF Shell, Next Launcher 3D, ADW Launcher, ADWLauncher EX, Holo Launcher, SS Launcher, Solo Launcher, Atom Launcher, and many more! + KitKat Experience App Helper – Easy-to-use interface to automatically apply theme on your favorite launcher, with info and help for optional Android launchers, includes KitKat Experience wallpaper manager, automatically send any missing icon requests, view all included dock bars, icons, icon names, and much more! + KitKat Experience Icon Pack(s) – Over 1,950+ Android 4.4 Kit-Kat inspired stock style icons, completely custom-designed icons inspired by latest Nexus 5 and Android 4.4 releases! Feel free to use built-in icon requester included in app or e-mail any requests you may have. + KitKat Experience Dock Bar Icons – Bonus icons include white or dark icons specifically for home screen dock bars, allowing you to customize this theme exactly to your tastes! 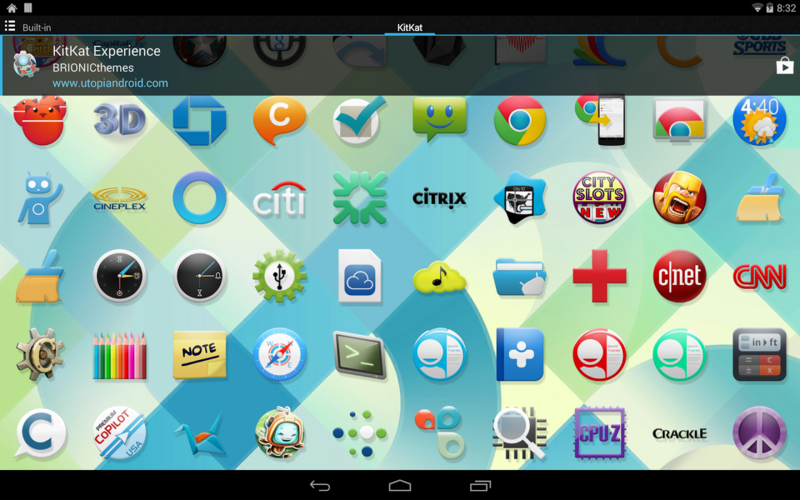 + Ultimate Android KitKat Wallpaper Manager – Perfect wallpaper management system with no fragmentation, smart wallpaper selector adds only the best wallpaper sizes to perfectly match your device. 60 different designs to choose from, designed in multiple sizes to perfectly fit the highest resolution tablets to the lowest resolution phones with full HD graphics. Cloud-based wallpaper picker allows you to directly apply or download wallpaper designs to your device, saving you more space. + KitKat Experience Clock Widget – Know when to have a break with the custom-designed Holo KitKat style clock widget, included in the theme and readily available in your widget pack. + KitKat Experience Dock Bar Pack – 40 different delicious KitKat style dock bars to choose from in a variety of styles and additional color options. + FULL KitKat Experience Launcher Graphics – Includes FULL supporting launcher graphics, such as folder backgrounds, menus, launcher icons, action bars, memory gauges, media systems, and much more, specially designed for each individual launcher! This is a theme (like a skin), you must apply it using built-in app, or you can apply it using your preferred supporting homescreen / launcher app settings (see support website for full instructions). This theme supports Apex Launcher, GO Launcher EX / HD, Nova Launcher, ADWLauncher EX / ADW.Launcher, Next Launcher 3D with 3D Scene Mode support, Action Launcher Pro, TSF Shell, Atom Launcher, Solo Launcher, Holo Launcher HD*, Smart Launcher, Lucid Launcher, SS Launcher, Themer and more! 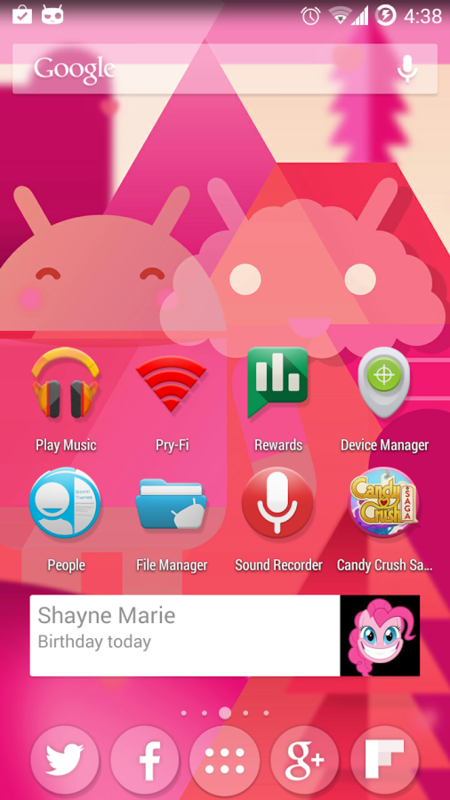 *You must manually apply theme on these launchers, full instructions in app and on support website.